I would happily stop eating meat if I was just feeding myself, as it is so expensive. I prefer vegetables anyway, especially when I have grown them myself. Sadly, my daughters feel deprived if I don’t give them meat some of the time. Fortunately, there are many veggie recipes that they will all happily eat, and this chick pea curry is one of them. 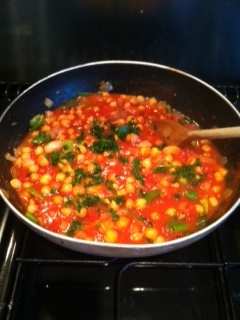 We had this chick pea curry tonight and it is a real family favourite. Healthy, delicious, easy and cheap. You could make it even cheaper by using dried chick peas, but I tend to go for the canned variety. I got this recipe from my thrifty mother, and we all love it. Chop the onions and fry until soft but not brown. 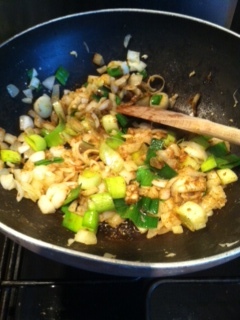 Add the spices and garlic and cook for a couple of minutes. Tip in the tomatoes, tomato puree and chick peas, then the stock. Cook for 10-15 minutes on a low heat, seasoning to taste. Serve with rice. My mum likes to mix in some sour cream or yogurt at the end and it is nice, but not essential. Chickpeas are great as a meat substitute. I use them (or lentils) as a filling for tacos and even my meat-eating brothers enjoy them! Going shopping tomorrow, will buy the ingredients for this. Hope it’s as yummy when I make it! Wow – this is really delicious! We’ve just eaten it for the second time, and it was just as good after having been frozen! Thank you for posting this recipe. You’re welcome. I often make too much so that I can freeze some. Better than a processed ready meal any day, and very much cheaper too.